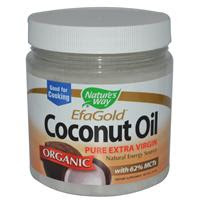 My hair loves coconut oil, and I've come to realize that one tub of coconut oil goes a long way in my home. I use it not only in my hair but on my skin, lips. While I dislike the scent my hubby and daughter absolutely love it. ... And I'm starting to believe that it's time to include it our diet. Below is the coconut oil I use, Nature's Way Coconut Oil. 52 Uses for Coconut Oil – The Simple, The Strange, and The Downright Odd! Must watch: Coconut Oil Touted as Alzheimer's Remedy and much more! My hair and I also love coconut oil also, and its fragrance. For persons who don't like the smell I recommend adding something like sweet almond oil or a little bit of an essential oil which will help mask the coconut oil scent.